Updates 29 Oct 2010 05:38 am by David ! It would be great if there was an actual link to the book on Amazon. The phrase “MOD is still under $10 on Amazon” would have been a perfect place for it. I applaud your heroic efforts — and your amazing results. I have been doing a smaller-scale campaign for my zombie novel Rise Again; it went from about item 3 million to between #3,000 and 4,000, depending on time of day. I think the key thing we’re not doing, and which we should do, is to create the common goal. If the purpose is to propel the book up the charts, and it’s a worthwhile cause, people will do that. I’m more or less just imploring them to buy Rise Again because it’s good. There’s no ulterior purpose. Whereas you’ve created a kind of flashmob happening. I guess I’ll have to buy the book. Too bad for Glenn! I do occasionally listen to Beck’s program (I’m a political Conservative) and though I didn’t hear the episode in question, I read the transcript. 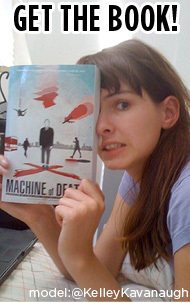 I sent him an email about the entire “Machine of Death” phenomenon and let him know how disappointed I was that, when confronted with a situation that’s clearly a triumph of capitalism – webcomics guys putting together a project and, through little more than word-of-mouth, attaining the #1 spot on Amazon – he instead jumped to a wrong-headed conclusion and decided to play the Moneyed Bully shaking his fist at those who dared infringe on his perceived territory. For what it’s worth, I’m sorry he reacted that way to you guys. It was wrong, and I hope he apologizes. @Brad – the link is there on the words “joining the culture of death.” Maybe that’s too subtle? @Devin – thanks for the note. It’s kind of you to respond and to speak in our defense. We have reached out and said essentially the same to Beck’s staff; I think our against-all-odds story is one that would resonate with his audience. I can help you with the mobi file. Shoot me a note. Any chance you guys will be selling this through Amazon.ca? I REALLY want this book, but the $12 in S&H is what’s holding me back. Hey guys, I’m trying to download the PDF flyer. I want to give it to some people and it keeps stalling at a 5% download (literally when I open it). Any thoughts? Using FF3.6.11 and an HP TouchSmart. Thanks again! My book arrived today!! I have become fascinated with the 1776LibertyBell Twitter account. 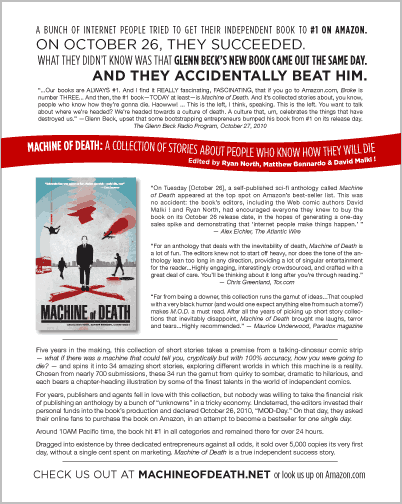 Whoever writes it is obsessed with Machine of Death’s Amazon ranking as compared to Broke’s, as if competition with that book was all that ever mattered. It’s almost as if that person is convinced Machine of Death was specifically written to undermine Broke’s statistics. I saw an article about this yesterday on Gizmodo or BoingBoing (can’t remember which, sorry) and checked out the description of the book. I promptly bought it because 1) it sounded interesting, 2) the price was great and 3) I love supporting indie projects of high quality. While I wouldn’t buy a book just to spite Beck (and by yesterday this no longer mattered anyway), the fact that you did beat him out on release day was certainly some very sweet icing on the cake. Got an email a little while ago that my book shipped so I expect it by Tuesday. And as of 6 PM Eastern, y’all are still holding on at #13 at Amazon. Mazel tov! It would be incredible if this gets publishers interested in all of you guys’ comic books! Personally TopatoCo works great for me but you deserve to have your books wherever you want them.